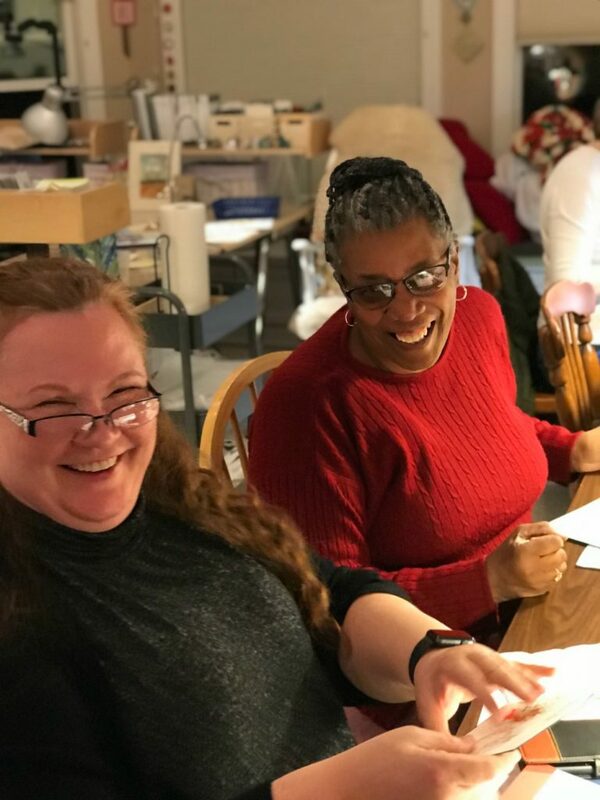 Today’s post features my three paper crafting classes in January, where participants made three projects and played with various techniques! These were especially fun events because one of the projects really lent itself to making it your own. It was amazing to see everyone’s creations! On the Brusho project, in particular, no two people did exactly the same thing, and that was a great treat to see. 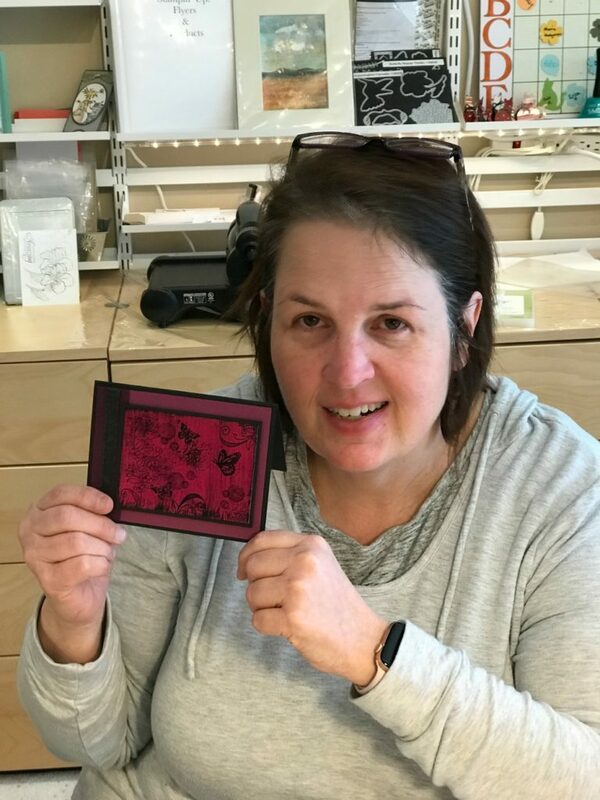 Here’s Dean with one of her Brusho projects. Club members have the option to make one or two of each project. Most of my regulars make two of each. Just ahead you’ll see one of my original designs for this project. 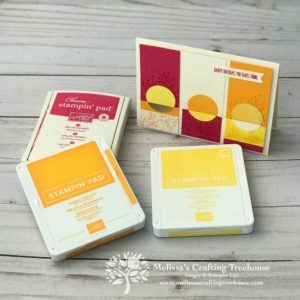 I had several images set up on a few Stamparatus’s so people had choices for how they made their card(s). 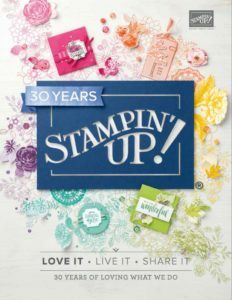 They could stamp repeating images as I did below, with my Hummingbird (or the flower), or they could stamp the Hummingbird and the flower image together as you can see Dean is doing above and in the sample just after mine. This is Tessie’s card just below. 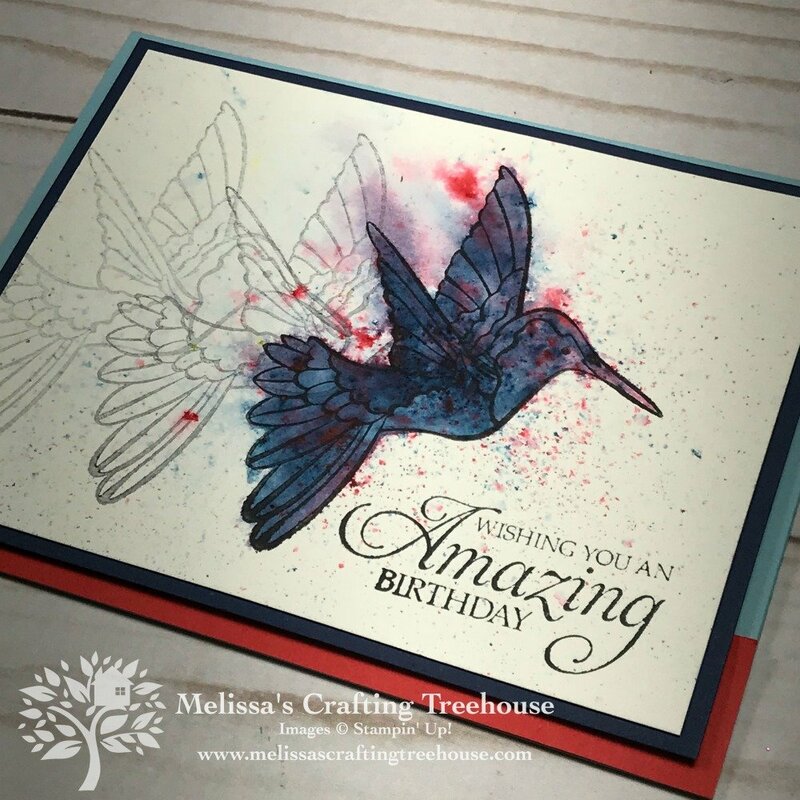 She used some of the paint palettes made with the Brusho to watercolor the images on her card. Meet Wanda and Stephanie! They are both regulars to my events. 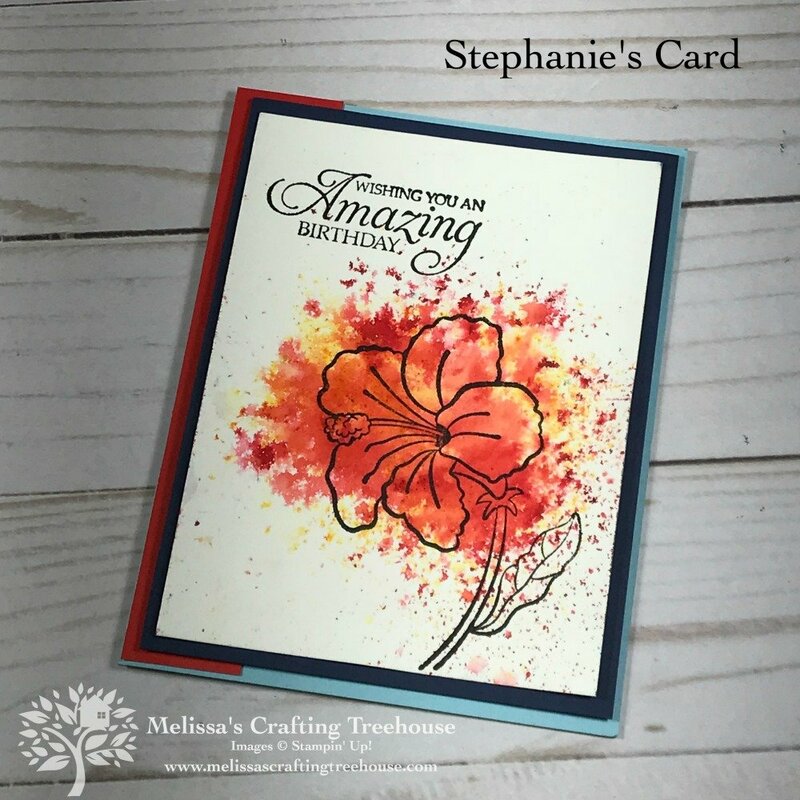 On Stephanie’s card below she reoriented her card and stamped just the one image. 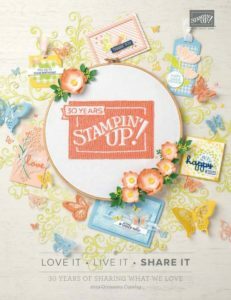 For this card, she simply stamped, sprinkled and sprayed to get this fun look. 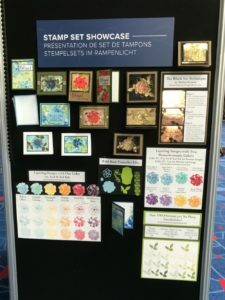 The Stamparatus was set up with this flower image as well. 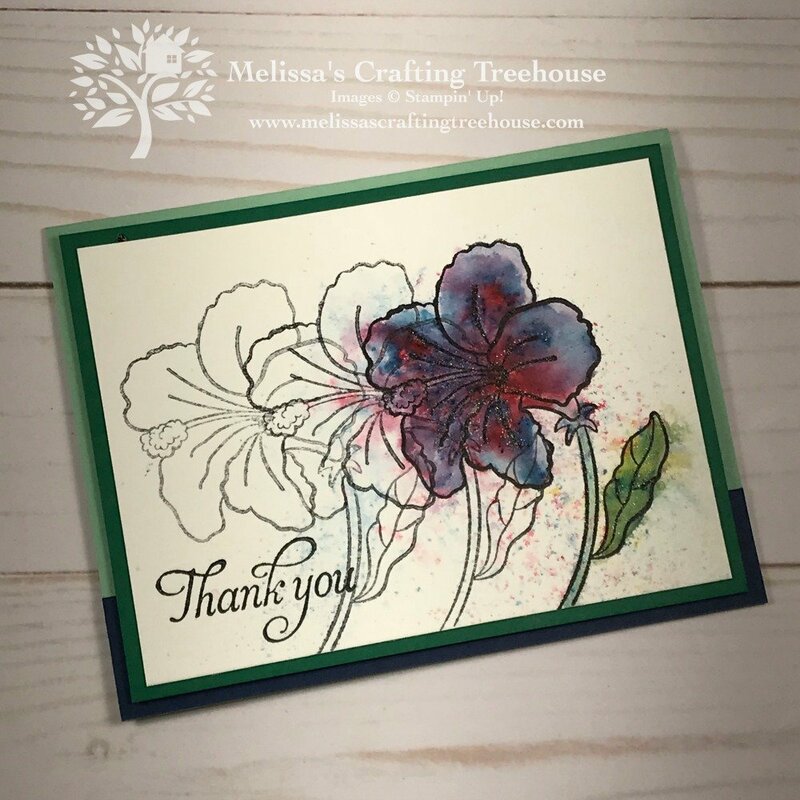 The version I made with this flower uses the repeat stamping method and the hinge step. Check out my Video tutorial by clicking HERE to see some of the focal pieces I made in the video and how to get various effects using Brusho. The pig from the “This Little Piggy” stamp set was one of the other images set up on a Stamparatus. I chose to do repeat stamping and I used a color palette made with the red Brusho and an Aqua Painter, to color in my pigs. Click HERE to see my previous post where I described how I colored these three piggies. These pigs ended up being the inspiration for about five different versions of this card. 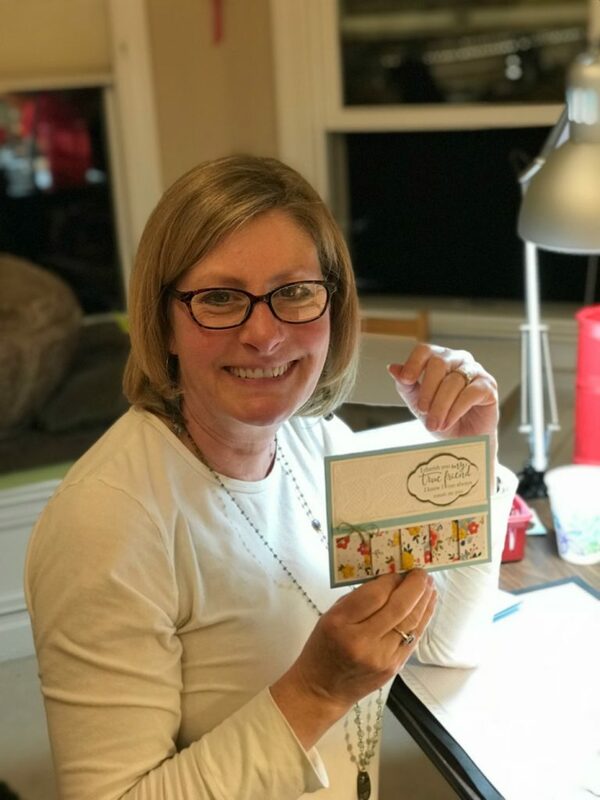 Jennifer, who you’ll see in a photo below did something different with her pig card and several of us loved it so much that we had to create our own versions. 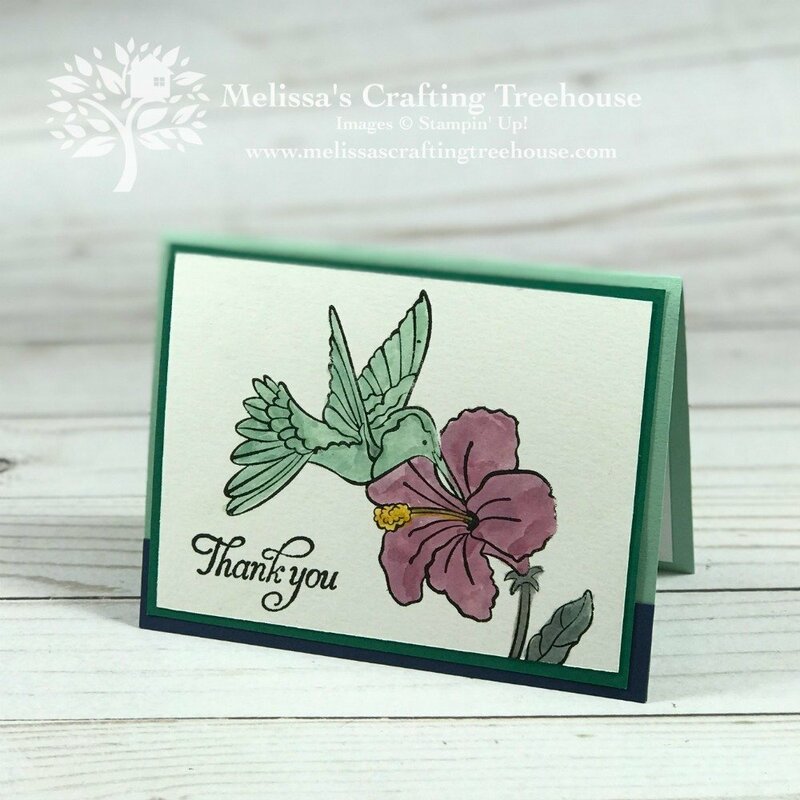 I’ll be sharing Jennifer’s card and the four others that Jennifer inspired in a separate post coming soon! 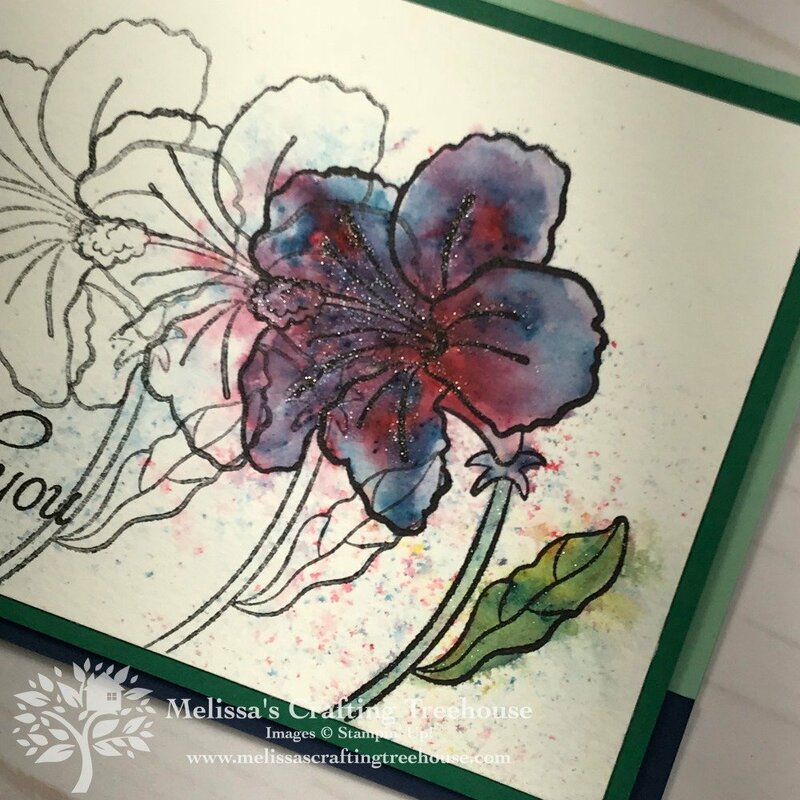 Click HERE to check out my original post with the details for these Brusho Projects. You’ll find a video tutorial there too! 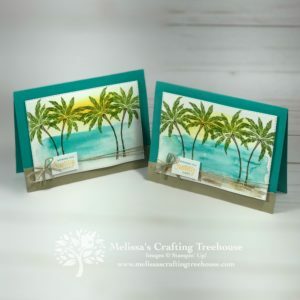 These next two cards show the second make n’ take at my January 2019 paper crafting classes. 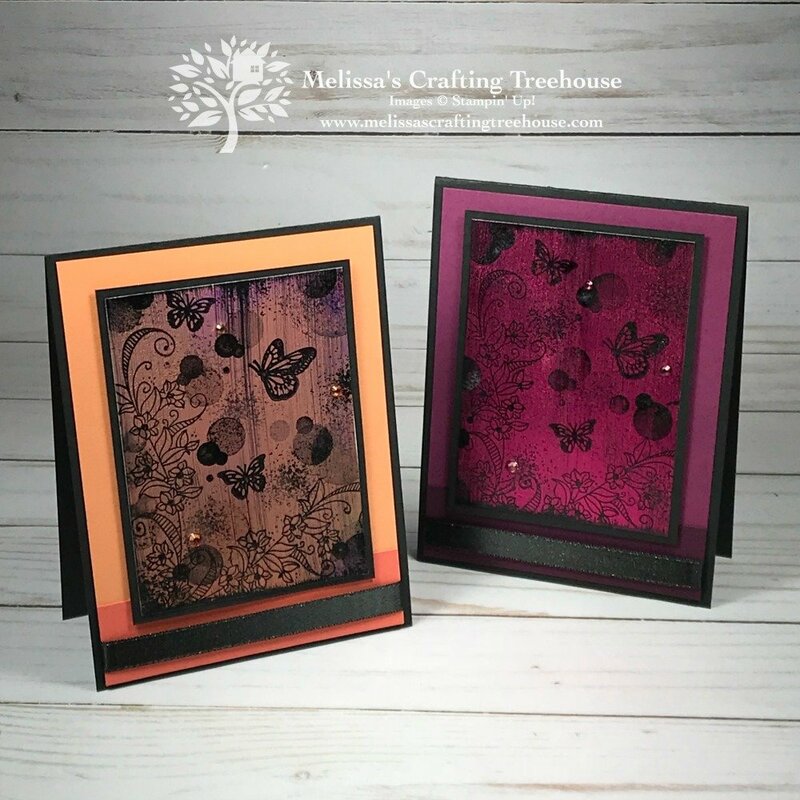 These use the Black Ice Technique on the colored Sale-A-Bration foil sheets. 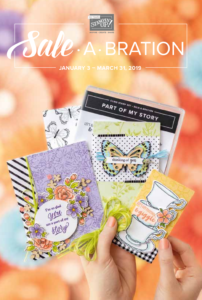 These are available as a free item with qualifying purchases during Sale-A-Bration (or while supplies last). 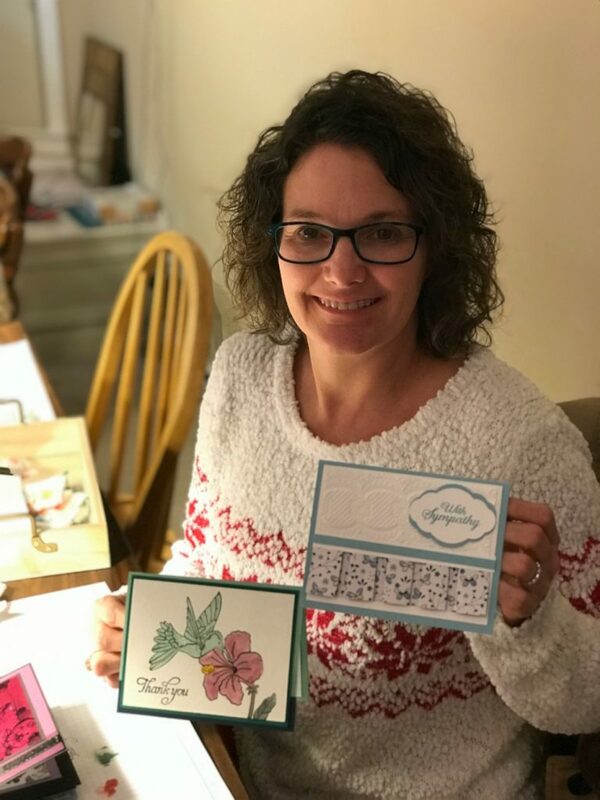 Here’s Jennifer with her version of the card. I love that she reoriented to mix things up a bit! Here’s Cecelia and Ellen making their Black Ice projects. … and Claudia making hers too! Click HERE to check out my original post with the details for these Black Ice Projects. You’ll find a video tutorial there too! The third make n’ take at this event was a Drapery Fold card. 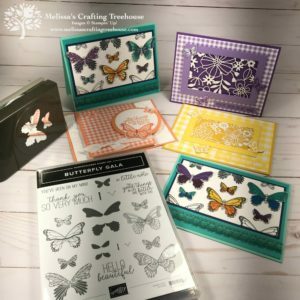 We used the Needlepoint Nook designer series papers in a variety of patterns. Here are two versions. 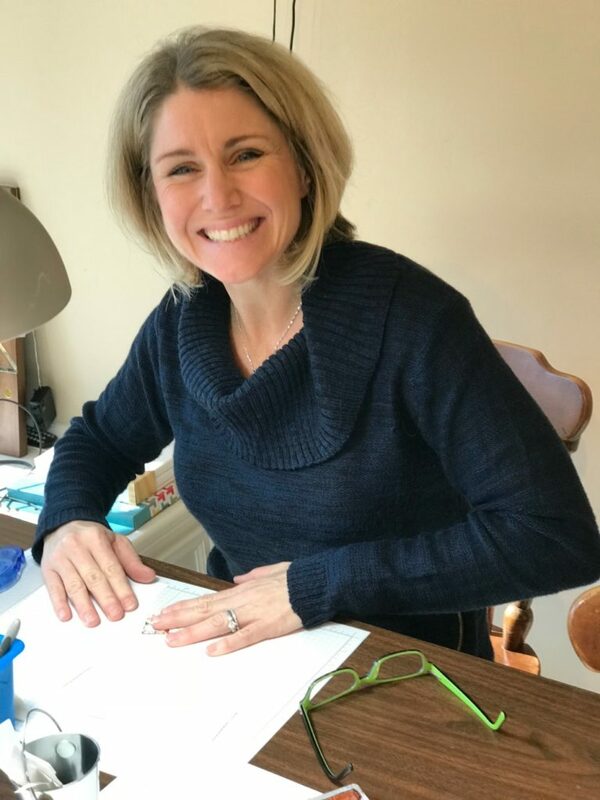 You’ll see another done by Tessie with a pattern in blues and butterflies later in this post. Meet Nicole! She’s making her drapery fold card here. 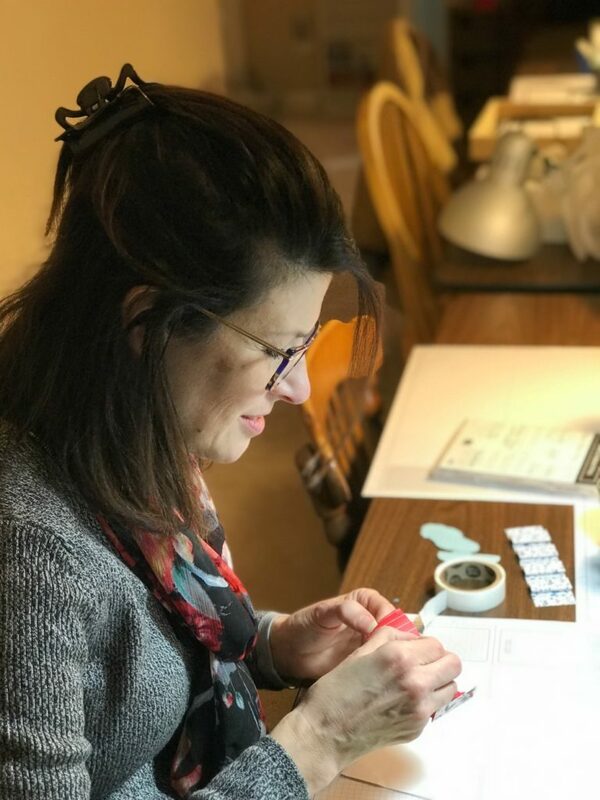 Here’s Lisa in deep concentration, also making her drapery fold card. 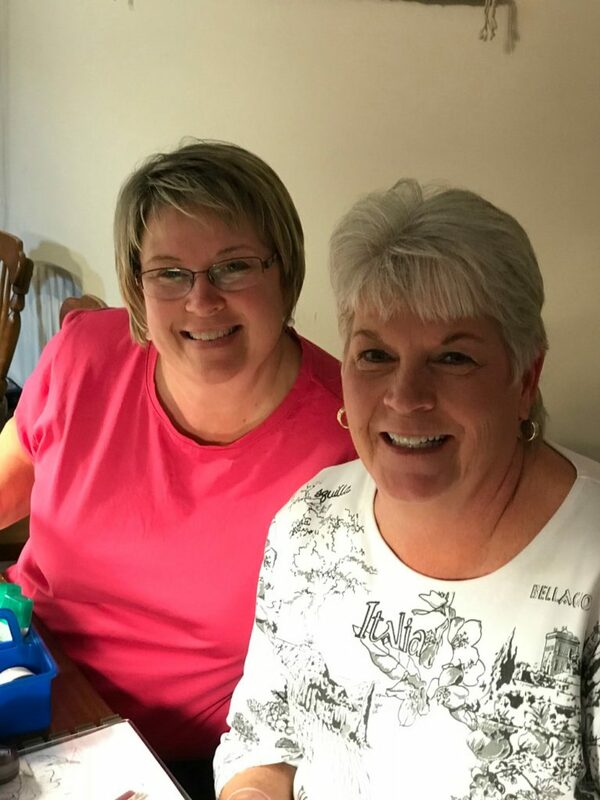 Meet Rosanne and Sue! Can’t you tell these two are great friends? They are the sweetest and I love them both! Here’s Tessie with two of her creations! She also made a fun alternative pig card. You’ll see that in my follow up post coming soon. Meet Peggy here. She’s been a club member for over 12 years! A few people brought guests this month! Thanks Edwina and Shelly for bringing friends! 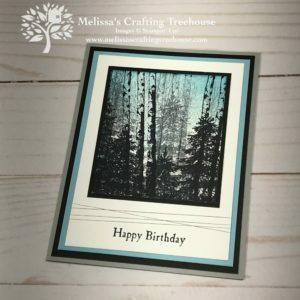 Click HERE to check out my post with the details for this Drapery Card Project. There’s video tutorial for this project too! Meet Kelly and Edwina here. 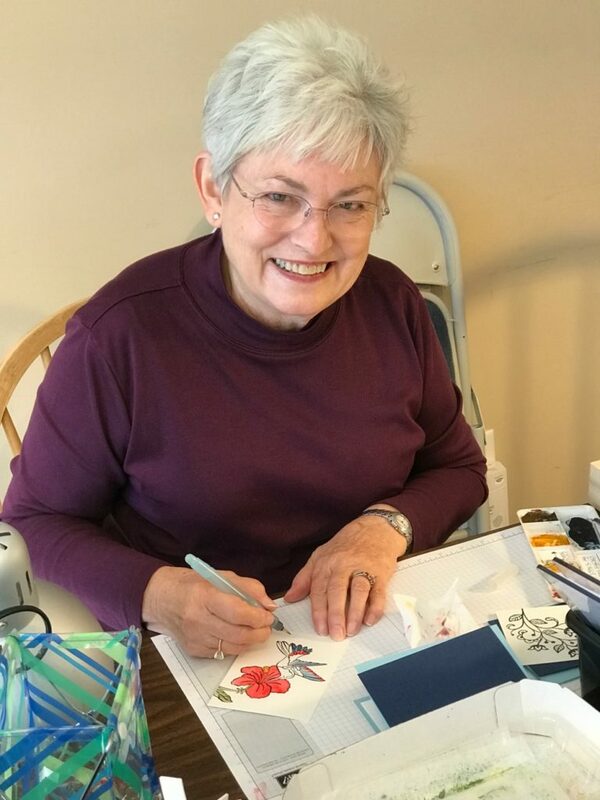 Edwina is a club member and fellow demonstrator. She brought her friend Kelly who was a first timer to a “Treehouse” event. 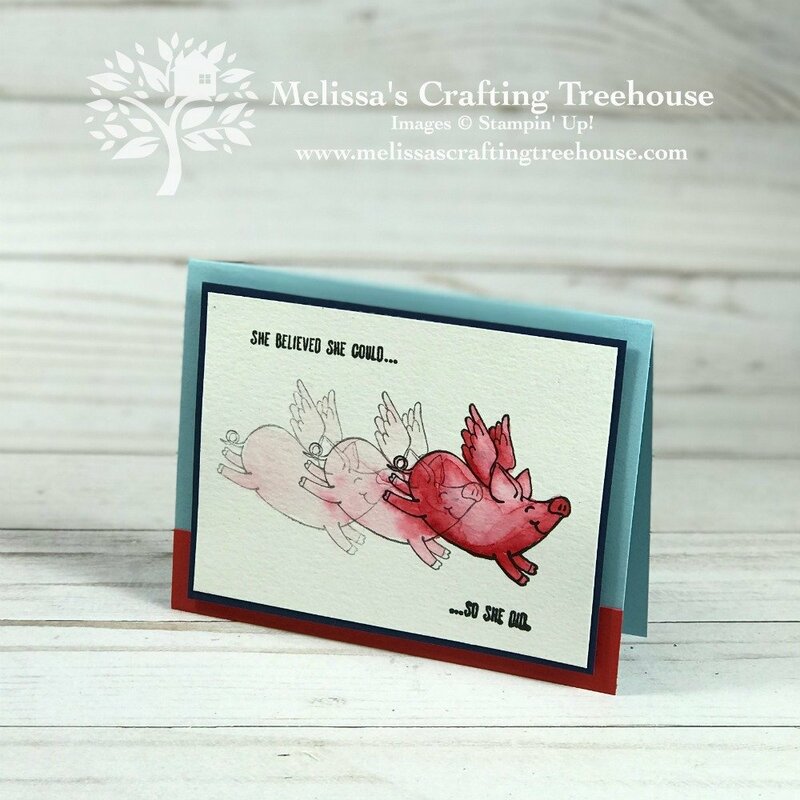 Kelly is clearly an experienced stamper because she made a super creative pig card that is so fun! I can’t wait to share all these fun alternative designs! 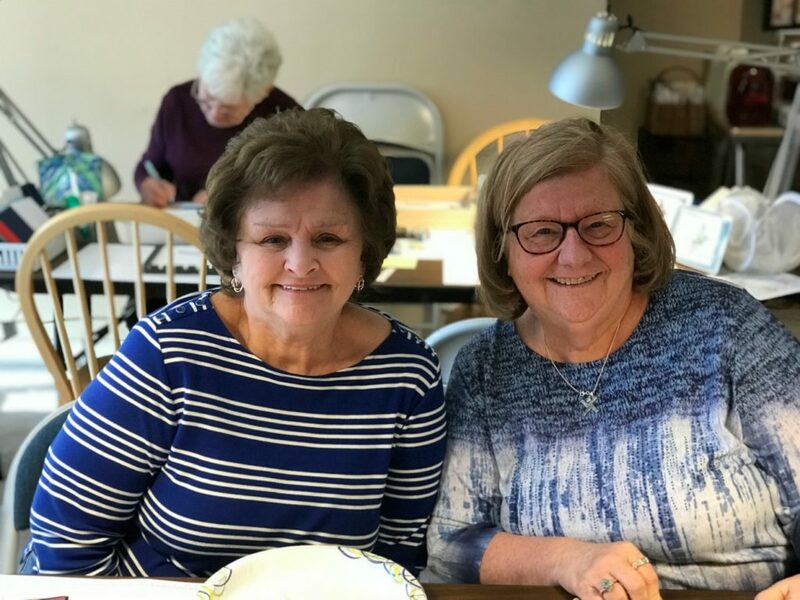 Shelly is also a long time club member and a demonstrator. She brought a guest as well. Lynn decided to join the club pretty much on the spot! 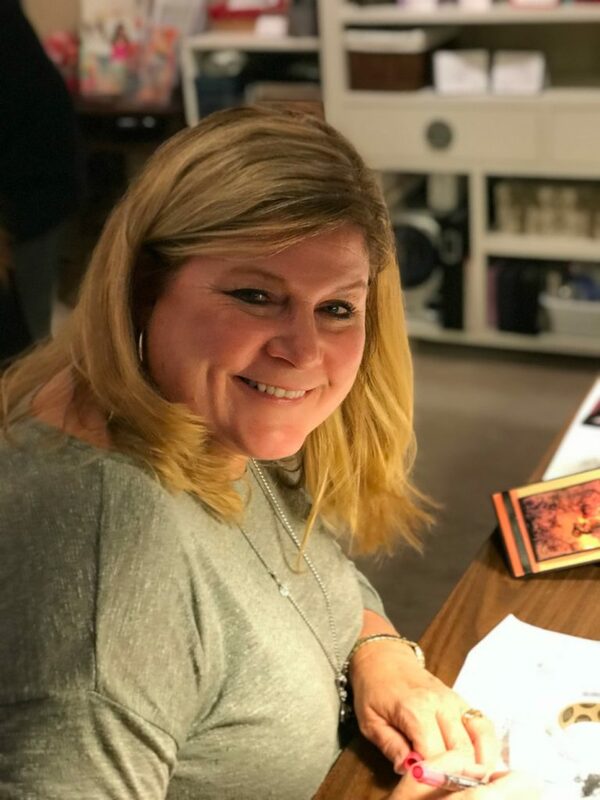 Welcome, Lynn! Last but not least here’s a group photo just for fun! 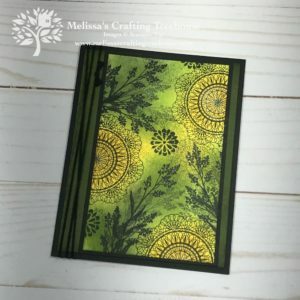 This is one of my three paper crafting classes in January. 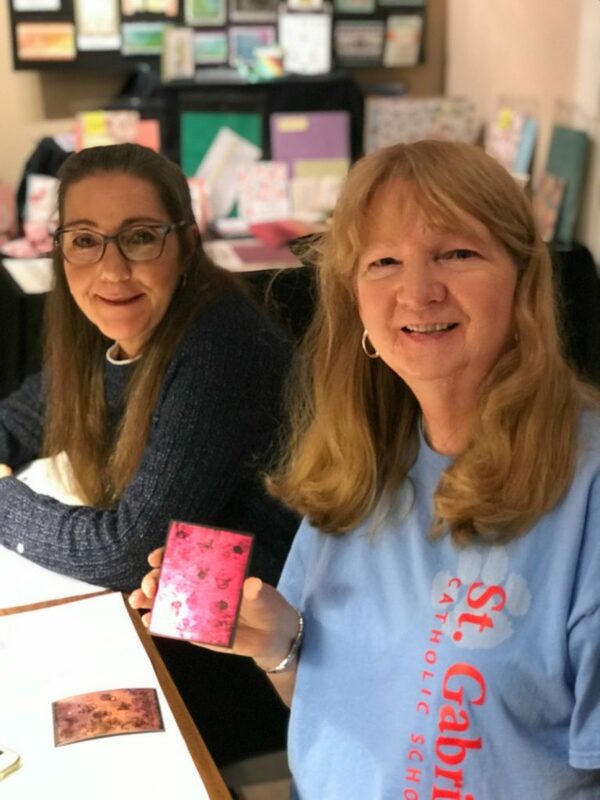 I hope you’ve enjoyed my post today and meeting some of my stamp club members and guests! 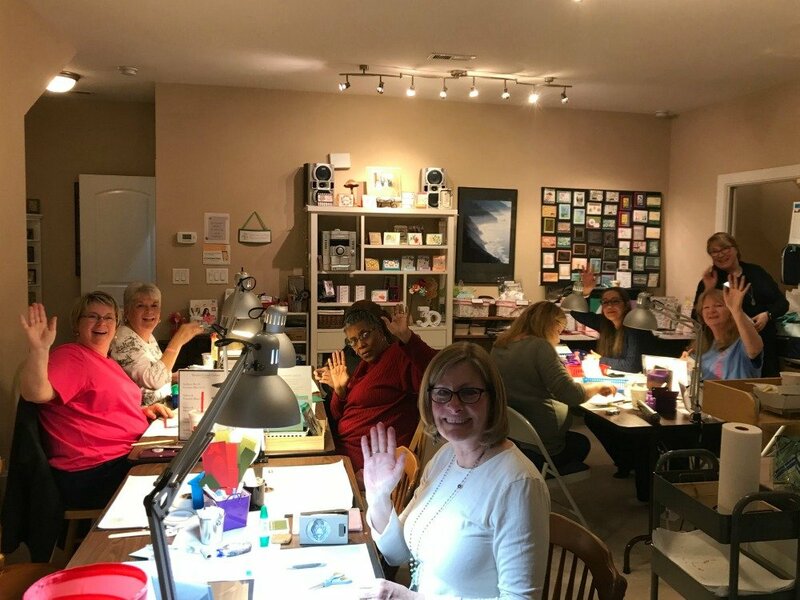 We have a blast together at these paper crafting classes! Maybe you’d like to join us! I offer online and in person options. 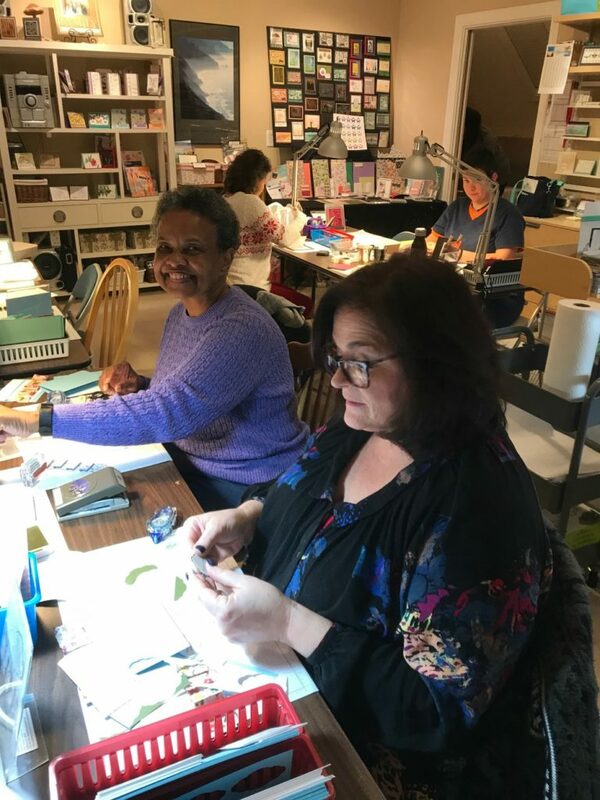 Thanks so much for spending some time with me today and seeing some of what we do at my paper crafting classes. Until next time… Happy Crafting!